Digital Alchemy makes finalist for Best Regional Recruitment Programme in the Human Resources Asia Recruitment Awards! 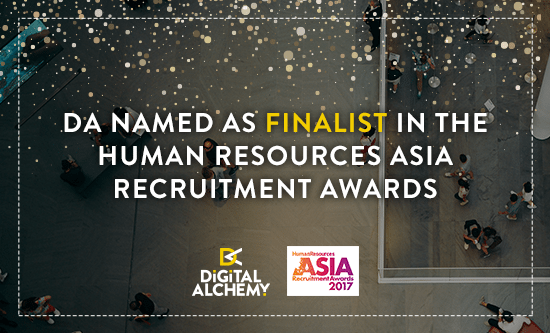 The Human Resources Asia Recruitment Awards announced last week that Digital Alchemy has been named a finalist for Best Regional Recruitment Programme. As a finalist we are eligible to win Gold in this category; all entries are judged by some of Asia’s most respected HR directors. The Human Resources Asia Recruitment Awards in Singapore honours the best HR recruitment strategies in Asia and focuses on innovation, technology, effective recruitment campaigns, and talent acquisition. The award show is taking place on 7 April at the Park Royal Hotel in Singapore, stay tuned for more updates!